Asmara, Eritrea’s capital, with its art-deco modernist architectures now listed as a world heritage site is home to the Church of Our Lady of the Rosary, often called “the cathedral”. It is a large Lombard Romanesque style church in the center of the city, built in 1923. 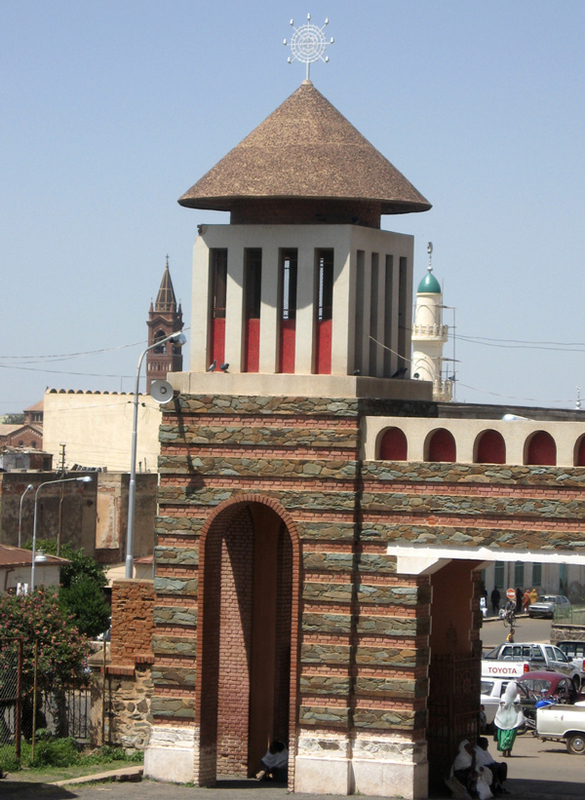 Asmara is also where you will nd the Khulafa Al Rashiudin Mosque, built in 1938, and the Asmara Synagogue, built in 1905. These are testaments to Eritrea’s exemplary cultures of ethnic and religious respect and tolerance where Jews, Christians and Muslims live together peacefully. These coexisting in uences make Eritrea, a beautiful kaleidoscope of cultures-where religious toleration de nes the population, equally divided between Christians and Muslims. On September 27, Eritreans will be celebrating Meskel, Feast of the Holy Cross, another religious holiday. Once again all Eritreans will come together as they have done with both Christian and Muslim religious celebrations throughout the ages. Eritreans commemorate Eid al-Adha, Eid Al-Fitr, & Ramadan of the Muslim faith, as well as Christmas and Easter, of the Christian faith, together. But these are not the only religious events that are observed together. In May, both Christians and Muslims make the annual pilgrimage to the shrine of Mariam Dearit, in Keren. Pilgrimages to monasteries such as Debre Sina, Debre Libanos, Debre Bizen, and other places of worship are celebrations that are deeply incorporated into daily life and are considered to be rich with meaning. They are also incredibly diverse. The presence of antiquated monasteries and the Al-Sahaba Mosque, the rst and oldest Mosque in Africa, built in 1400 AD, attest to Eritrea’s long religious history. Whether it be honoring a patron saint or celebrating one of the many Marian devotions that exist throughout the country, Eritrea is a deeply religious nation. It is an exemplary model of harmonious religious and ethnic cultures of tolerance and respect. It is not unusual to nd friends and neighbors sharing in festivities of the many patron saints. Anyone who has been to Eritrea will attest to the peaceful coexistence that exists amongst the ethnically and religiously diverse population and nd it hard to reconcile the reality on the ground with the negative and often exaggerated external narratives. There have been a mushrooming of new religious movements throughout Africa and Eritrea has not been spared. These movements are a way indigenous people try to deal with change within a world that does not separate religion from the rest of life. In general, the new religious movements arise in the context of social and cultural conditions characterized by disharmonies of opportunity, status, and political and socioeconomic stress generated when a traditional culture is faced with modernization. Which factors are relatively more important is a matter of debate. Some of the new religious movements entered Eritrea during the struggle for Eritrea’s independence, many from Ethiopia and neighboring states, and their administration and development were not rooted in local tradition. As with all movements of late, it comes as no surprise that “Eritrean Faces” serve as tools to advance NRMs. Eritrea knows well the harm of religious fanaticism and is a nation that has had to confront both Christian and Islamic fundamentalism. introduced in the country. Eritrea’s independence in 1991 coincides with the rise in NRMs in Africa as well as other related global events. In 1998, the US International Religious Freedom Act was signed into law and the US Commission on International Religious Freedom was established by the United States Congress. The act was followed by the establishment of the US International Commission for Religious Freedom (USCIRF). Another global event that affected Eritrea was the launch in 2000 of the “Joshua Project” in the United States. The stated mission was to reach “unreached groups” around the world who were “ripe for harvest”- for evangelization and conversion. In Eritrea the “unreached groups” are the Afar, Bilen, Kunama, Rashaida and Saho- considered by the Joshua Project and other groups to be predominantly Moslem, and therefore were targeted for conversion. These conversions and other acts in the name of “religious freedom” are a threat to Eritrea’s peace, stability and security, as well as the population’s peaceful co-existence and it would be irresponsible of the government if it did not take appropriate action to defend its citizens. Instead of obeying Eritrea’s laws, some groups and individuals aligned with western NGOs chose to put pressure on the Eritrean government to rescind the proclamations and allow the NRMS and their sponsors’ free reign in Eritrea. The youth, especially the educated sector became primary targets. NRMs have put a strain on family ties and threatened to erode the authority and cultural relations with established religious institutions in the country. Some individuals and groups mobilized US based churches to advocate on their behalf. So it comes as no surprise to see institutions such as the US based Baptist Ministries, which has no presence in Eritrea ( there are no Baptists in the country), contributing to the reports produced by the Special Rapporteur on Eritrea at the UN Human Rights Council. where Embassy informants, including pastors, told US of cials what they wanted to hear. Not surprisingly, some of the informants, including the God fearing pastors, were removed from the country as soon as the cables were released. It will take more than a sitting to go through the barrage of assaults on Eritrea’s culture of ethnic and religious cultures by the above organizations. Suf ce it to mention a few. Eritrea has been the target of a huge enterprise – a “network” of organizations, individuals, and churches, which have used “religious freedom” as a pretext to infringe on its sovereign rights. They include church groups such as the Baptist Ministries, government bodies, such as the US Commission on International Religious Freedom (USCIRF), think tanks, academics and related organizations in the vast “Christian networks”, such as Open Doors, Christian Solidarity Worldwide, the Voice of the Martyrs, Strategic World Impact, Good Samaritan etc. etc. While there have been many campaigns to undermine Eritrea’s development and progress, the one targeting Eritrea’s religious institutions has been the most insidious and most dif cult. of NRMs in Africa has given rise to religious intolerance as some NRMs try to force sovereign countries to accept them as legitimate religious organizations. While some comply with national laws, others refuse to do so. Worse are the politically motivated groups and individuals who insist on denigrating Eritrea’s religious cultures at international forums. Since its inception, the US Commission for International Religious Freedom (USCIRF) has been heavily in uenced by these networks as its reports on Eritrea have been a replica of what is disseminated almost on a daily bases by US based organizations. The urry of religious media alerts, about a country and people they have very little knowledge of, but through some sense of “Christian Solidarity”, have been unprecedented. Emboldened by anti- Eritrea political climate in the United States and Europe, these networks have joined the anti-Eritrea campaigns using “religious freedom” as a pretext. USCIRF’s recommendations to place Eritrea on the list of “Countries of Particular Concern” for the last 12 years attest to the political motivations behind the list. There is nothing in Eritrea that warrants such concerns. Eritrea remains a strong, religious country where all citizens, no matter their faith, live in harmony. The cultured and conscious people of Eritrea will not allow religious charlatans to prey on the vulnerable… In Eritrea, everyone has the right to practice one’s faith, but that right does not extend to the imposition of “your faith” on others or harm others with impunity, and claim a religious privilege to do so.